RUN indicates that the target board is executing the program. 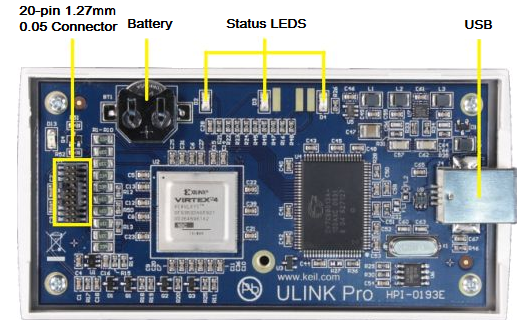 COM indicates that ULINKpro and the target board are communicating. USB indicates that ULINKpro has been powered. USB Connector is the plug for the cable that connects ULINKpro to the PC's USB port, transfers data, and powers the adapter. The 20-pin connector (1.27mm/0.05" - Samtex FTSH-120) inside ULINKpro is a plug for the cable that links to the target connector. No other hardware configuration is required. DO NOT remove or exchange the battery. The internal battery is designed to last a ULINKpro's lifetime. Removing the battery from its location will make ULINKpro unusable. Target Interfaces describes the connectors that can be used. 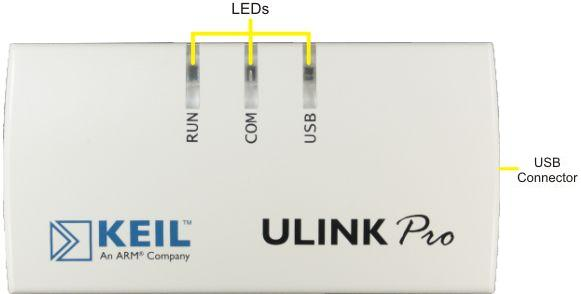 Interface Schematic describes the ULINKpro internal signal wiring. Start Sequence describes the steps ULINKpro follows when connecting to the target hardware. Reset Sequence describes the reset sequence ULINKpro tries to execute.